Many people instantly recognize The Scream, one of the most famous paintings of all time. It made headlines around the world when it was stolen twice, in 1994 and again in 2004. Yet not many people are familiar with the artist, Norwegian Edvard Munch. He is one of just a handful of artists who has an entirely museum devoted exclusively to his works. 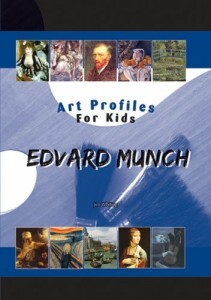 The profile of Munch explains how the artist attempted to convey his deep feelings of anxiety in his paintings. He became preoccupied with death at an early age, and he also created many works alluding to the disastrous results that can occur in relationships between men and women. One chapter includes some slightly gory details about the day Munch’s lover shot his hand as he tried to keep her from killing herself. Goes beyond basic facts, providing historical context and significance of the art and the artist. Provides plenty of information for reports in a reader-friendly format.